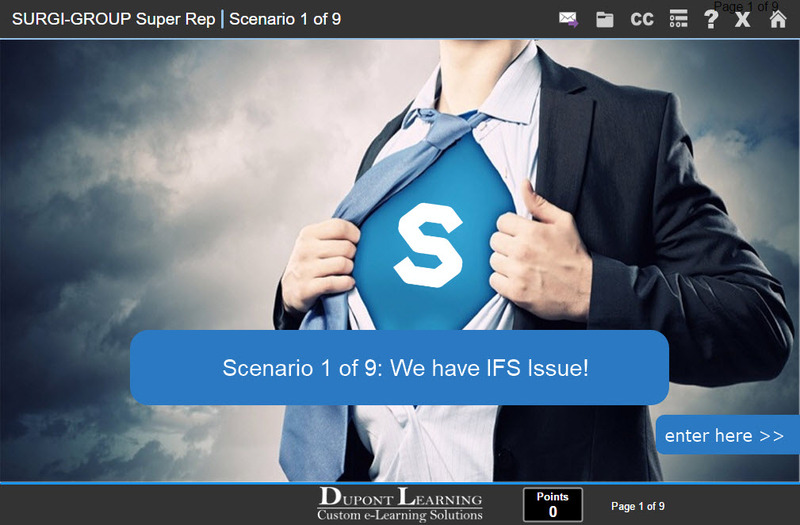 Super Rep Scenarios are self-paced, interactive e-learning modules that illustrate key real-life situations where your Rep has to solve a problem or decide “what would you do in this situation?.” Solving the simulated problem will help handle real-life situations more calmly and effectively. These modules typically include voice-over narration (your SME’s voice or Dupont Learning’s professional voiceover). Reps earn points as they answer questions correctly on their first or second attempt … and passing the course requires a specific point total. This is the simplest and least expensive method, where the entire training module can often be created in less than a day. This training model uses your current training documentation, converted to pdf format, and adds a certification test. It’s not considered the best teaching method, but it is far better than paper and pencil. Certification and record keeping (pass/fail/complete/not attempted) is automatic, changes to content are simple, and reports are sent out to managers automatically. Development cost is very low. Our first Custom Product Training e-Learning course, back in 2002, was a video that showed window shade installers how to adjust clutch tension to accommodate the size and weight of the custom commercial shade. Adjusting the clutch wasn’t very easy to explain, as you had to wrap this thing around that thing, push down on this as you pulled that. … If you never did it before, there was nothing intuitive about it. The shades came with an installation manual, but the adjustment was difficult to explain using text and images. There was a training solution, which involved flying window shade technicians to the company’s CT headquarters for a one-day technical training program. Travel costs and time out of the field were prohibitive, so most techs opted to stay home – and just read the technical documentation. They would then call for technical support, and eventually get the clutch adjusted properly, but after much time and frustration. This took a toll on the technician and created a strain on the company’s support staff. What was needed was a YouTube video. A streaming video showing a person how to adjust the clutch would be easy. But back in 2002, there was no YouTube, video cameras were expensive – and took some expertise to operate and publish the video. If you invested in a camera, publishing it for remote viewing was tricky. Videos would be slow and grainy, buffering constantly, so technicians would often give up – and go back to the paper instructions. Fast forward to today, the iPhone X has a 12-megapixel wide-angle camera with f/1.8 aperture, high dynamic range and optical image stabilization. It is capable of capturing 4K video at 24, 30 or 60 frames per second, or 1080p video at 30, 60, 120 or 240 frames per second. Pretty impressive! ABC just announced that Jimmy Fallon’s Tonight Show on March 25, 2019 is being shot entirely with a Samsung Galaxy S10+ smartphone … More proof that product training videos can quite possibly be shot with the smart phone that is in your pocket! Many products are software based, and users (sales/service reps, employees, customers, etc.) have to learn how to use the software. The best method for teaching software applications is with either a YouTube-type demonstration, or with a simulation, were users have to click tabs and inter data as if they were live in the software application. Popular tools for demonstrations and simulations are Captivate and Camtasia. We generally use Captivate for simulations, and Camtasia for demonstrations. Let us know if we can provide samples of each involving your own software product. While live video using your own SMEs, or professional actors is better, it is also more expensive and time-consuming. Animated scenarios uses illustrated characters instead of actors. While some people don’t consider animated characters to be professional enough, in my experience, they can do a pretty good job teaching – as users follows gestures and facial expressions, while listening to the voice – and ultimately … learn what is being taught. So no, it is not as good as real human characters, but it is better than just voice-over, and far better than just reading. Oh, and it is much less expensive and time-consuming as SME’s or actors. Again, we are happy to provide a demo using your own content so you can judge for yourself. Already doing live WebX training? Why not record the session, add a test – and produce the self-paced version as a SCORM object … launched and tracked on your (or our) LMS. This is a no-brainer if you are already using webinars. We can also edit your recordings, eliminating any wasted time, or we can chop the video into smaller chunks so users can view just the topics they need. No matter which method you choose, it is a good idea to begin by creating a training outline, identifying each of the key product features or functions you want to teach. From there, you create short content segments, so users can select just the training they need. A hyperlinked table of contents allows them to jump to any and all topics if they choose. You may also consider adding QR Codes to your physical product, so users can scan the code to pull up instant how-to videos on that specific function. Once content is organized by chapter or topic, we add a certification test to quantify the learners understanding of your product. Question types can be Drag and Drop, Matching, Hot Spot, Multiple Choice, T/F, etc. Once the certification test is passed, the user becomes a “Certified” technician, with documentation to show that he/she knows how to use your device. With e-learning, the key to the success is for all of your sales and service managers to be totally on-board with your training efforts. They must be fluent with your training content, and they must know who has been trained, and who has not. We make most managers “Reporters”, and we set them up to receive automated weekly or monthly reports telling them how their team is doing with the training. If these managers support the training content, the automated e-learning platform, and have an appreciation for the beauty, efficiency, and effectiveness of these online training objects, your training system will work! And you will know because service calls will be fewer, and correct and full use of all product features will be significantly higher. Let us take a look at your product training objectives, and offer advice on the best e-learning methods for your product and budget.